Publisher: Printed and published by W. F. McLaughlin and Bartholomew Graves. The FB Reader service executes searching for the e-book "An historical review of the state of Ireland from the invasion of that country under Henry II. 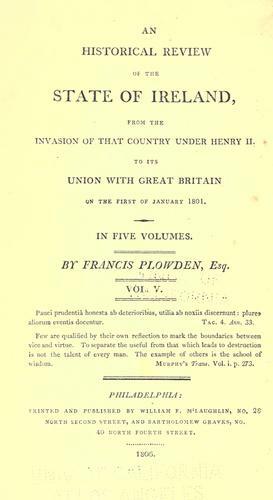 to its union with Great Britain on the first of January 1801…" to provide you with the opportunity to download it for free. Click the appropriate button to start searching the book to get it in the format you are interested in.